Destiny, a video game in which players travel through space wondering why the hell they can’t get new artifacts, has a brand new quest that might be the most complicated thing we’ve seen in the game to date. It involves completing the new raid, finding a whole bunch of secrets, and... converting binary numbers to decimals. Destiny! Players first started piecing together this quest over the weekend, when they discovered that Rise of Iron’s new raid had a chest nobody could open. Secret-hunters quickly figured out that the key to accessing this chest lied in five monitors, spread all throughout the raid, that could each unlock one of the laser beams that blocked entrance to the chest area. Problem was, nobody could figure out how to reach the fifth monitor. What the image means/The monitors : So, the image was obviously the cylinder room with the big pyramid. After stepping on the shown cylinders (the ones “filled in”), a loud noise occured, and some users quickly found that the monitors in the previous “server farm” room could be activated. When activated they would flash some binary. At this point, Datto and co. tweeted/logged on Twitch, having already figured out the monitors and gave the information out to viewers. As it turns out, one monitor (the one with SIVA on the wall behind it) is the “column” monitor, and you need to translate the binary into a decimal digit (ex: 0010 -> 2), and the other monitor is a “row” monitor. These correspond to positions in the cylinder room, and it’s pretty much just a game. First time you activate both monitors, someone has to jump on the correct cylinder in the “0" sector in the room, then the monitor flashes to a new number, and someone needs to jump on the correct cylinder in the “1" sector. After doing 4 jumps, the pyramid opens, and you get an Exotic Engram, the Emblem, and access to the last monitor. Still with me? Once you activate that last monitor, you can find the hidden chest, which lets you unlock Rise of Iron’s fourth and final exotic weapon quest. This post is a good walkthrough of how to do it. You and your raid group need to stand on specific canisters in the diamond room, activate some monitors, run some numbers through a binary hex converter, then go get the hidden chest. That’s just the start. Once you get the quest, you’ll have to go through a series of even more convoluted steps involving SIVA engines, puzzles, and boss fights. You’ll also have to do a bunch of things with a fireteam comprised of a Warlock, Titan, and Hunter. It’s ridiculous. 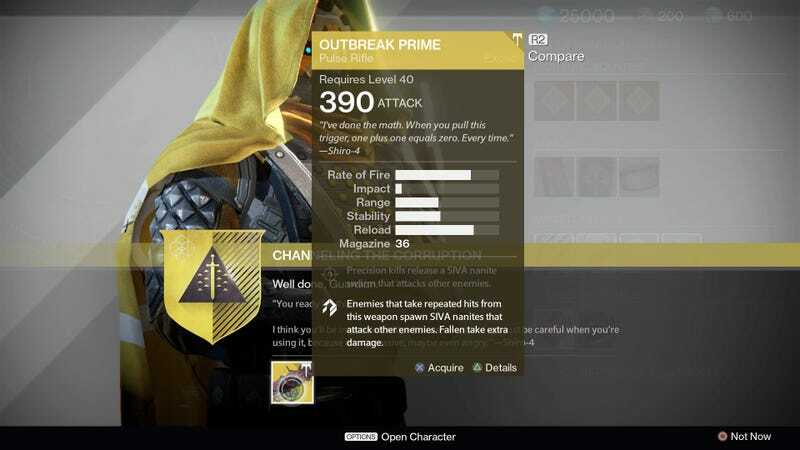 It’s one of the wildest quests we’ve seen in Destiny so far. Here’s the full walkthrough if you want to try it for yourself.